Keep skin safe outdoors with Vichy Idéal Soleil Face & Body Sun Protection Milk, an SPF30 sunscreen suitable for the whole family. Formulated with a Mexoryl®XL-based UVA and UVB filtering system for maximum protection, the sun lotion blends effortlessly into skin without white residue, creating a shield against the harmful effects of the sun. 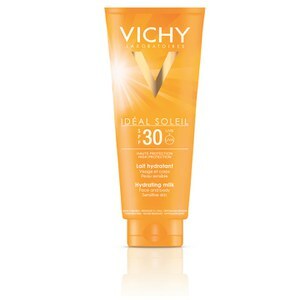 Delivering wide-spectrum protection, the sun milk also contains Vichy Mineralizing Thermal Water for a soothing effect. Apply generously to the face and body. Re-apply every 2 hours and after swimming or sweating.